SOUTHERN UTAH – St. George residents began setting sandbags Sunday and city workers were checking storm drains to make sure they were free of debris in preparation of heavy rain forecasts as moisture associated with Tropical Storm Norbert near Baja, California was expected to arrive in Southern Utah Sunday evening, according to the National Weather Service. The significant moisture surge in Southern Utah prompted a flash flood watch from Sunday through Tuesday evening. With a prolonged period of moderate to heavy rainfall and embedded thunderstorms expected to produce widespread rain amounts of 1-3 inches and up to 5 inches of rain in some areas. 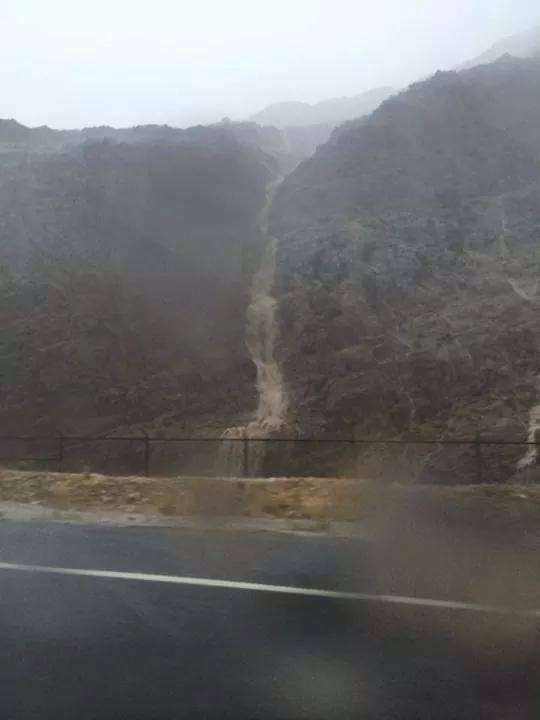 The northbound lanes of Interstate 15 in Arizona through the Virgin River Gorge have reopened after closing earlier this evening because of heavy rain, according to the Arizona Department of Transportation. The southbound lanes of I-15 in Arizona will remain closed from the Utah state line because of a closure in Nevada. I-15 in Nevada is shut down from milepost 64 to milepost 112. This closure is expected to last several days. I-15 in Nevada is closed near Moapa, Nevada, at Nevada milepost 91 because of damage from flooding. Large segments of the roadway have washed away. Motorists should check with the Nevada Department of Transportation for more information. Old Highway 91 is also open. Mesquite, Nevada is still without power. Mesquite Police reported that electrical power for the entire city of Mesquite will most likely be out until Tuesday morning. We have posted a video of Reid Gardner switch yard in Moapa. They will not be able to have any of their crews enter the yard and assess the problem until the flood waters reside. We will be able to have some power restored through another source, which will allow us to have rolling brown outs throughout the night and into tomorrow. As information becomes available we will continue to post throughout the night. Updated at 7:15 p.m.: The Mesquite Police is reporting that I-15 northbound in Arizona is closed at mile marker 8 at Beaver Dam, and I-15 southbound is closed at mile marker 14 at Black Rock road. Water and rocks are currently on the roadway. There is no estimated clearance time yet. 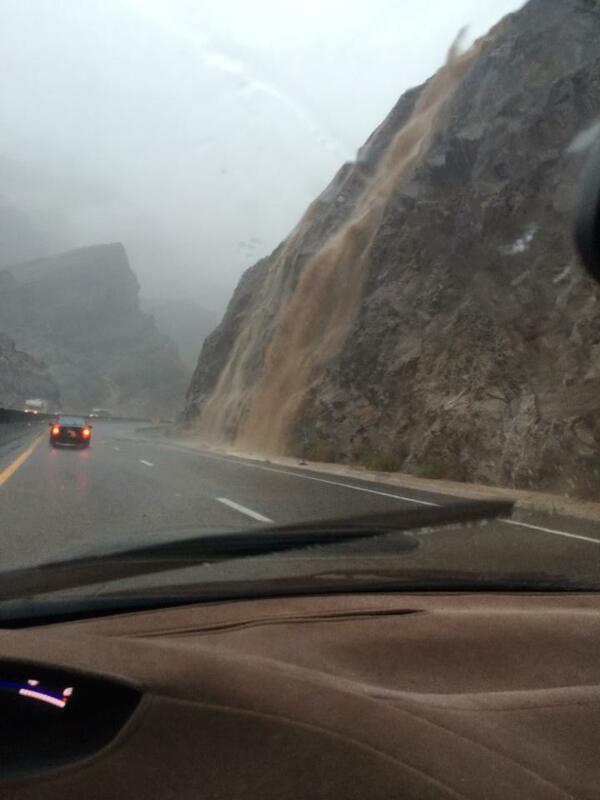 UPDATE at 6:50 p.m.: UDOT reports that I-15 Exit 2 southbound is closed due to flooding. Posted by the National Weather Service over Twitter at 5:54 p.m: FLASH FLOOD WARNING expanded to include a portion of Washington county until 8:45 p.m. Flooding has been observed and more flooding is imminent. In St. George, Mayor Pike posted on his Facebook page asking people to take precautions. “Please get ready for potential heavy rainfall tonight! Protect window wells, and other vulnerable areas around your home and business!” Pike said. UPDATE at 7:34 p.m.: UDOT is reporting all alternative routes from St. George south are closed and should be avoided. 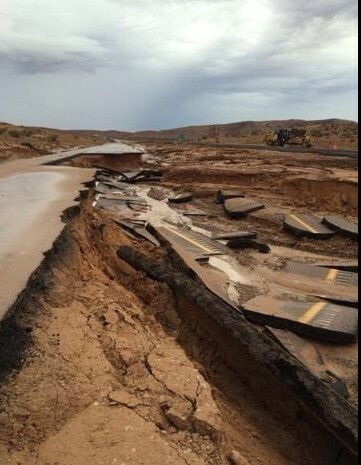 Southbound I-15 at mile post 92 in Moapa, Nevada, has been washed out by the flood. UPDATE: 6:15 p.m. I-15 in Arizona at milepost 14 northbound and southbound is closed at this time. The Arizona Department of Transportation reported that heavy rain and rocks on the roadway on I-15 have closed portions of the highway. The northbound lanes of I-15 are closed at Littlefield (exit 8). The southbound lanes are closed at the Utah state line. There is no estimated time to reopen the highway. Drivers should expect significant delays and consider delaying travel. The Mesquite Police Department reported around 4:15 p.m., Utah time, that U.S, route 93 by Moapa, Nevada, has been washed out. The National Weather Service out of Las Vegas has also reported over Twitter around 4:30 p.m., that Moapa, Nevada, was hit with 4 inches of rain in two hours. “Very dangerous situation continues here,” the NWS Las Vegas Office tweeted. The Nevada Highway Patrol has closed I-15 southbound at milepost 112, and northbound at milepost 91 due to the flooding. Power was out from Moapa to Mesquite in Nevada and is also out in Littlefield, Arizona, and the surrounding area. While power was reported restored at one point, crew with Overton Power District 5 are working to restore power overall. In Mesquite, Nevada, Mesquite Fire and Rescue Capt. John Gately said there are fire and police officers at each intersection to inform traffic where and what to do during the power outage. Overton Power District 5, which oversees the area, posted on Facebook at 5 p.m. that it may take 4-5 hours to restore power, noting the problem is at a generation plant. Gately said the flooding is 30 miles north in Moapa, Nevada mile marker 91. I-15 is completely shut down in each direction. Flash Flood Watches are also in effect in the region until later this evening. Cars are floating down I 15? Get sandbags to the library! Mori, please keep the updates coming! I am supposed to go to LV in the morning for class. You know, that is really unhelpful. I’m sorry, Lala – what I meant was it wasn’t looking good, we were updating as fast as we could. Does anyone know how bad it is around 500 South and Bluff? Or on Red Hills Parkway? Is the St.G library going to flood again? Power’s back on in Mesquite. Doesn’t look like anyone can go west for a few days. Mori’s Da Man! Thanks for the coverage and props to the photographers! Thanks for covering the Mesquite Area. Mesquite Local News has become “worthless” so I now look to St. George News for Mesquite updates. Just watched a video of a landslide in the Gorge! AWESOME! Not only that the Volkswagen Passat handled a landslide only popped a tire! DAS AUTO! Is there any way what so ever to get to mesquite from las vegas ? I-15 through the gorge open southbound and northbound. But closed passed Mesquite I believe at the Bunkerville exit.